-feasts before the main ceremony. -dancing by the houngan and/or mambo and the hounsis (students studying Vodun). The dancing will typically build in intensity until one of the dancers (usually a hounsis) becomes possessed by a Loa and falls. His or her ti bon ange has left their body and the spirit has taken control. The possessed dancer will behave as the Loa and is treated with respect and ceremony by the others present. -animal sacrifice; this may be a goat, sheep, chicken, or dog. They are usually humanely killed by slitting their throat; blood is collected in a vessel. The possessed dancer may drink some of the blood. The hunger of the Loa is then believed to be satisfied. The animal is usually cooked and eaten. Animal sacrifice is a method of consecrating food for consumption by followers of Vodun, their gods and ancestors. 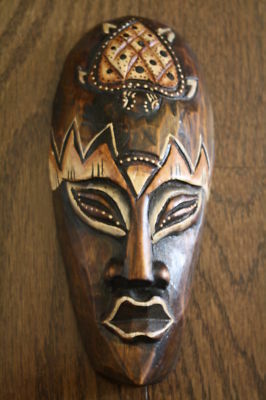 These are two African masks that can be used in ritual. 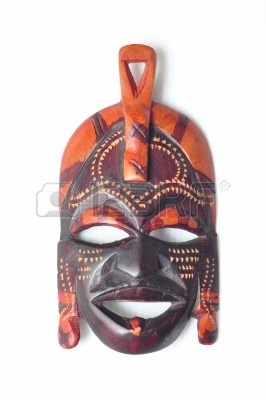 There are hundreds of different mask styles that can be used.